Be My Neighbor is Taking Off! This new series of 16 free downloadable house "blueprints" from MODA is a hit! The large blocks are a great way to use those precious scraps you can't bear to part with because, well, you just might need them, right? (And we totally understand!) When finished the quilt will measure 68 x 84, and we'll provide setting instructions as well. Click here for Block 2. Remember, every week, from Sept. 5 through Dec. 19, a new "blueprint" will be available in our newsletter and on our website. Even if you don't have time to make them now, download the blueprints while you can-they will only be posted for 2 weeks! Missed Block 1? You can find it on our website for one more week. 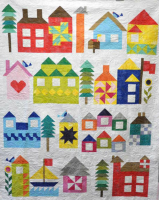 Be the first to bring in a completed Neighborhood quilt and win a prize from Quilt Patch! Please join us this Saturday, Sept. 17, for our monthly Saturday Night Sew. We usually start at 3:30, but since the classroom is available all day you're welcome to come as early as you'd like. Everyone is welcome! Give us a call to reserve your seat (704-821-7554). There is a $2 fee, we order out for dinner, and wrap up around 8:30. See you there!